The newly designed Heat-N-Breeze combines the Hound Heater with an incredibly long life whisper quite fan, bringing fresh air into your dog's house in hot weather. 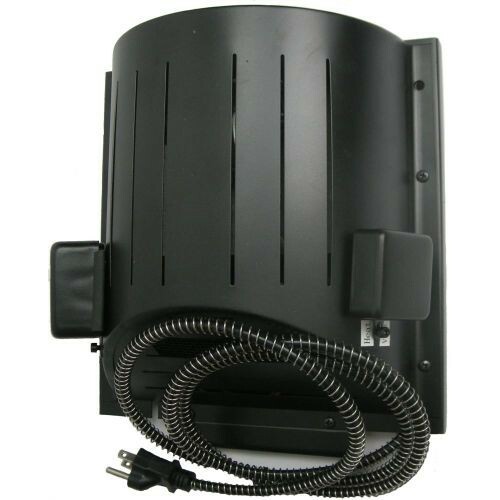 The Heat-N-Breeze looks just like the popular Hound Heater, and even mounts to the same mounting plate. It draws outside air into the dog house at a rate of 24 cu. ft. per minute at a quiet noise level of less than 45 decibels, by a 30,000 hour silent fan producing a soothing sound for your dog. It refreshes the air within 1 to 2 times per minute. The built in thermostat allows you to set the fan to turn on and off at your preset temperature of choice, saving you power when the fan doesn't need to run. You simply set it and forget it! The unit itself is made of 16 ga. powder coated steel, making it indestructible. It is this easy. Flip a switch, turn the thermostat clockwise, and the Heat-N-Breeze is a Hound Heater, the world's best selling pet house heater! Flip another switch adjust the thermostat and it becomes the world's best pet house ventilator, the Hound Breezer. Easy to install (instructions included), easy to use and it will last for years! Also new this year, all covers protecting the controls are locked using a simple "allen/hex screw". All units come with a spring protected cord to help prevent chewing, accessories/tools to make installation easy-..we've even included the screws! Features: Breezer fan-30,000 hr. rated life at 18 watts. Heating element, 50,000 hr. rated life at 150 watts (replaceable). Thermostat +/_ 4 degrees F. 100,000 cycle rated life (replaceable). 8 ft cord, w/3 prong grounded end. Weight 6 pounds. Dimensions: 10" x 10" x 4.5". The newly designed Heat-N-Breeze combines the Hound Heater with an incredibly long life whisper quite fan, bringing fresh air into your dog's house in hot weather. Will the fan blow out heat? I want to hook up the heater for winter and hook up the breeze later on can I do that? . The fan is not specifically made to do what you're looking to have it do. Although it may be able to be done, we can't be certain since we don't carry this product in our warehouse. It's best to contact the manufacturer to get the best answer. The heat and breeze unit cannot be hooked up to another unit in order to make it work for heating/cooling. For further specifications we recommend contacting the manufacturer.